Intravenous Vitamin C; The Answer to Cancer in the Dog? Vitamin C is a well known nutrient, being found in many fruits, vegetables and from synthetic sources. This nutrient is a potent antioxidant and vital for many cellular functions, including tissue repair and immune health. Many dog owners likely don’t give vitamin C a second thought, regarding their dog’s health, cancer, or even recovery from illness. But, is there more to vitamin C or ascorbic acid, that you may not know? Especially when it comes to therapy options in certain cancers in your dog? Could vitamin C or ascorbic acid be the ‘answer to cancer’ for your dog? Vitamin C or ascorbic acid is naturally produced within your dog, through various cellular mechanisms. Unlike humans, the average dog does not require added vitamin C to their diet or in supplement form, in most cases. Humans, on the other hand, have lost the ability to internally produce vitamin C and thus, are reliant upon the intake of ascorbic acid from foods eaten or supplements. Vitamin C is necessary for vital functions in the body, including cellular health, immune health, and tissue repair via collagen activation. Vitamin C is also needed to help support adrenal health and balance the stress response within all bodies, including the dog. When it comes to cancer therapy and support, vitamin C, as an added nutrient can provide numerous benefits. But, most will argue how can this be, given that the dog or other species can internally make their own vitamin C? If they need it, they should produce it internally, right? Wrong, at least in many cases. Cancer in the dog is on the rise, and vitamin C is a nutrient we need to pay attention to. The body, including that of the dog, produces many chemicals and nutrients naturally as a means of self preservation, healing, and vitality. Vitamin C is just one of many. These nutrients that are produced internally are deemed non-essential, meaning that it is not essential to have them provided via food groups or supplements, because the body can naturally create them. However, you need to look at this a little deeper with some understanding. The first major consideration is that in order for the dog’s body to produce vitamin C and other nutrients, to support health, other nutrients and co-factors must be present in the food that they eat. Meaning, they can’t eat junk food full of empty calories and preservatives, and believe that the co-factors for vitamin C production will be present. The primary diet must be rich enough in nutrient provision to provide for the body’s ability to produce these nutrients. The second major consideration is that there is the concept of ‘supply and demand’, which does apply to nutrients including vitamin C in your dog. This essentially means that the dog’s body has a limited production capability for some nutrients, including vitamin C, and if there is a higher demand for this nutrient due to disease or other health ailments, the ability to produce or supply it may not keep up. So, you can have a dog with cancer, that is quite debilitated on many levels, and although he is able to produce vitamin C internally, it may not be enough to keep up with the present demand. Vitamin C is necessary for many cellular functions in the dog, including tissue repair and immune health. Vitamin C is also more well-known for it’s antioxidant capabilities, which is the ability to fight off free-radicals and minimize oxidative stress damage in the dog and other species. This capability helps the dog’s body to ward off infection and recover from injury, not to mention aiding in the recovery from stressful events. However, again, these benefits stretch much further potentially than just day to day healing and recovery. In human research papers, dating back several decades, the concept of Vitamin C deficiency has been noted in cancer conditions. Again, humans cannot produce internal Vitamin C, and thus are highly dependent on the intake from food or supplement sources. In past times, Scurvy was a common medical condition in people, noted to be a direct result of a vitamin C deficiency. In Scurvy conditions, the affected patients were noted to have loose teeth, bleeding gums, bruising, and generalized weakness, among other symptoms. These clinical signs are all due to vitamin C not being available to interact on a cellular level, producing collagen to support teeth and bones, and not being present to support proper circulation and vascular health. Now, research has noted that in many human malignant cancer conditions, there is a vitamin C deficiency noted in patients. In a trial dated back to 1974, the authors noted that in 50 patients with malignant disease, 46 patients demonstrated vitamin C deficiency and evidence of sub-clinical Scurvy. (1) There are numerous other research papers, more distant and more recent, that also substantiate the observation that many human cancer patients are deficient in vitamin C.
The question remains as to how and if this applies to the dog, especially given that they produce their own internal vitamin C? That is a good question and to date, this concept has not be fully evaluated. In human research, vitamin C levels are routinely evaluated in the blood, but on the veterinary side of blood testing, these laboratory procedures are not routinely performed nor available. Precise ‘normal’ levels of vitamin C in the dog have also not been completely determined in all scenarios. Does this mean the theory of vitamin C deficiency in cancer cases does not apply to the dog? Not necessarily. There are few theories that apply, when it comes to vitamin C deficiency and cancer therapy, both in the dog and humans. The first theory is that many of these patients, both human and dog, are deficient in the nutrient which has opened the door for increased susceptibility to cancer development, not to mention other diseases. This deficiency may be due to reduced intake via a proper diet or it could be due to relative ‘supply and demand’ issues, as mentioned above. In reality, if you look at many cases of cancer, whether if early stage or advanced, there are co-existing signs of Scurvy in those patients. So, one could argue, almost, that cancer is a disease secondary to Scurvy, or that really cancer is Scurvy. The second theory really doesn’t look at a deficiency state of vitamin C in the cancer patient, but more so looks at what vitamin C can do, when in optimal levels or higher, to benefit that patient. This is where ‘mega-dose’ supplementation comes into play, either by mouth (orally) or in the intravenous form. The use of vitamin C in human disease conditions, including cancer, dates back several decades. The original ‘forefather’ of vitamin C therapy is debatable but many give credit to Dr. Fred Klenner and Linus Pauling, both of whom focused on vitamin mega-dose therapy. Both of these researchers and clinicians take us back to the 1950’s or earlier with their findings and usage of vitamin C in human disease conditions. In many of those early cases, vitamin C was utilized due to a perceived deficiency state in the patient, and by using high doses, the body could be replenished quickly and clinical results were often evident in a short period of time. Over the years, vitamin C has gained more attention, mainly in research and the alternative medicine fields. Through increased research, what has been noted is that vitamin C has tremendous potential in cancer therapy, above and beyond the primary nutritive and immune functions. As mentioned before, vitamin C is a potent antioxidant, helping to protect normal cells from oxidative cellular function. Vitamin C can also recharge other antioxidants in the body, helping to keep a health level of support. This last point is key as it is important to keep in mind that for health to exist, there must be a balance of antioxidant support in the body. After an antioxidant neutralizes or stabilizes a free radical molecule, it will become an oxidant or free radical itself which can cause damage to the body. This is a natural chemical reaction, due to donating an electron, but in normal circumstances, that altered antioxidant that is now a free radical, is quickly stabilized or ‘recharged’ by another antioxidant in the body. Vitamin C is one of these ‘re-chargers’ and can help to reduce this harm. Seeing this basic chemical reaction that takes place, hopefully you can then see that if there is a high level of any specific antioxidant in the body, relative to others, this recharging effect may be exhausted and thus, that high level of the specific antioxidant could cause damage. This is the theory behind ‘mega-dose’ vitamin C usage in human and dog cancer cases. By supplying the body with a very high level of vitamin C, you are inducing oxidative damage to cells, which includes cancer cells. Doesn’t sound like a great idea, does it? The interesting thing with mega-dose vitamin C therapy is that it does produce oxidative cellular damage, likely through the production of hydrogen peroxide, but this cellular damage actually appears to SPARE normal healthy cells! This means or implies that ‘mega-dose’ vitamin C therapy, when done properly, actually targets damaged cancerous cells, creating cellular death, but generally inflicts little to no harm to normal, health cells. Quite the contrary to current cancer therapies including chemotherapy and radiation, where both cancerous and healthy cells are negatively impacted. In addition, supplementation with vitamin C in the dog with cancer also serves to benefit primary functions, including host defense mechanisms (immune support) and collagen production. The immune benefits are obvious and by enhancing or supporting the immune response, cancer cells can be targeted. The support of collagen production is an interesting concept as well, as collagen is not only involved in tissue repair and skin health, but collagen makes up the matrix or environment around cells. By enhancing or supporting collagen production, it is also quite possible that tumor invasion or spread can be reduced, by forming a ‘wall’ around it, and also strengthening the matrix around the tumor. There are many perceived benefits to ‘mega-dose’ vitamin C therapy in human research and clinical usage, but does it apply to the dog with cancer or any other health ailment? In the mid 2000’s, I was asked to be a part of an ongoing clinical study, using some of our dog patients with cancer. This study was further exploring the use of intravenous vitamin C in human cancer models, evaluating tumor markers after usage. As a part of this study, we enrolled about 20 dogs with various forms of cancer and administered what is often referred to as the “Myer’s Cocktail” to them twice weekly. The Myer’s Cocktail is a common recipe of vitamin C in high doses, combined with other supportive nutrients, administered in a saline solution to the patient. Each dog patient received an infusion twice weekly for as long as they were enrolled. In addition, tumor markers in the blood were monitored monthly. The dogs enrolled had a variety of cancers, ranging from osteosarcoma, to malignant melanoma, squamous cell carcinoma, and lymphoma. The hardest part to the trial, in all honesty, was getting the owners to bring in their dogs twice weekly for the infusions. Did I see results in the dogs enrolled in the study? Yes, results were very commonly noted and ranged from a generalized improvement in appetite and energy to some cases where tumor burden was reduced. The blood work studies indicated that in some patients, there was a reduction of tumor markers, while in others, not so much. This data was never published and was only a trial we were participating in at the time. After this trial, seeing the results that were gained, I decided to implement intravenous vitamin C therapy in many of our other cases of dogs with cancer. I altered the doses of vitamin C used, and instead of using a cocktail, I just focused mainly on the vitamin C dose. In addition, most of these dogs with cancer were given a new diet, using whole-foods, along with specific herbs to continually support the patient in their quest for recovery. Here are my thoughts after likely hundreds of cases of vitamin C usage in the dog. First, I will say that there are many benefits that can be gained in the dog with vitamin C usage, and those benefits extend beyond the cancer patient. Most of the dogs, if not all of them, almost instantly gained more energy and had an improved appetite. This was noted within a hour or so after the infusion and was generally maintained for about 2-3 days after the infusion. The vitamin C intravenous infusions improved their quality of life. Third, the dogs tended to recover quicker from anesthesia and surgery, if that modality is utilized as a part of their cancer therapy. This is likely due to enhanced tissue repair effects, cellular function, and antioxidant status. Due to this impact, intravenous vitamin C became a part of our normal intra-operative protocol in almost every dog undergoing surgery. Fourth, many tumors did respond to the high dose intravenous vitamin C therapy over time. In most, the infusions were given twice weekly and continued for at least a month if not longer. The response rate, regarding tumor size and burden, generally was noted after the first couple of infusions. In a handful of dogs, the tumors completely resolved and the dog went into a state of remission. In the majority of others, the tumor size was reduced, but appeared to reach a point of stagnancy, with no further reduction in size. The one critical thing that was noted was a condition commonly referred to as “tumor lysis syndrome‘or TLS, which is a situation in which the vitamin C therapy had such a profound effect on the cancer cells, that there was a massive kill-off, which created a toxic-like condition in the dog. Ideally, you desire a slow kill off of cancer cells, as with cell death, there is a potential release of toxic byproducts and inflammatory chemicals through that cellular death. In cases of TLS, so many cells died off so quickly, that the release of these toxic byproducts created harm in the patient. In those situations, which were all solid-tumors, the only remedy was to quickly get the dog to surgery so that the tumor could be resected or debulked in size, which would reduce further harm. Finally, intravenous vitamin C therapy benefited almost every dog with cancer, but in my hands, the only dogs that truly benefited regarding the cancer condition, where those with solid tumors. The dogs with blood cancers, such as leukemia or lymphoma, benefited clinically, but their cancer conditions were more challenging to get into a state of remission. Vitamin C Therapy in the Dog; Intravenous or Oral? When it comes to cancer and vitamin C therapy, the intravenous route appears to be the most ideal. The reason for this phenomenon is that when vitamin C is given orally or by mouth, there is a limit as to how much the body can absorb at any given time. So, you could give a dose of 2000 mg but only absorb 200 mg with each dose. This then limits the blood levels that can be achieved. This is often referred to as the ‘bowel tolerance‘ effect of vitamin C. Each dog or person will vary, regarding this effect, and the amount absorbed could be dictated by the relative need of the body. The higher the oral doses used, the more likely the dog would develop gastrointestinal upset on some level, which is due to the osmotic effect of vitamin C.
Intravenous vitamin C helps us to get around this effect and aids in achieving very high levels of ascorbate in the blood stream for any given time period. In human research and alternative medical centers that utilize intravenous vitamin C therapy, they will usually monitor blood levels of ascorbate or vitamin C. Cancer research and clinical experience with intravenous vitamin C indicates that a certain level is desired in the blood, which is rather high. By monitoring blood levels, the patient’s dose can be titrated to reach those desired levels. This is not routinely done in veterinary medicine, mainly because blood levels of vitamin C are not easily obtained from traditional laboratories. Despite this, intravenous vitamin C is still safely and effectively used by many veterinarians in dogs with cancer and other conditions. Now, you are likely seeking a set dose that can be used in your dog, and in this regard, I will likely disappoint you. There is no set dosage, in all honesty. In human research and clinical usage, there is a wide range of doses that are used in the average person, ranging from a few grams to 20 grams or even higher. It is really dependent on the practitioner, their experience, their level of comfort, and the disease condition in the patient. 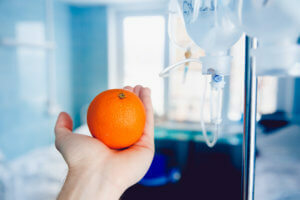 A person with an allergy attack, as an example, will likely benefit from a much lower dose of intravenous vitamin C compared to a person with cancer. This same phenomenon exists in the dog with a wide range of doses utilized, dependent on many variables present and what the end goal is for that patient. You also have to keep in mind that dogs exist in many shapes and sizes, from a Chihuahua to a Rottweiler. Instead of dosing a fixed dose, we dose based on weight or pounds, using a low starting dose and moving up to a higher dose over time. The main reason is that despite most vitamin C intravenous therapies not creating any harm to the patient, there is a slight risk of tumor lysis syndrome in a small group of patients. Thus, I would generally start at a lower dose, evaluate the dog, and increase that dose over time, monitoring closely. A single infusion of high or mega-dose intravenous vitamin C can provide benefits to the dog with cancer, mostly on the level of increased energy and appetite. But, that single dose is likely not very beneficial regarding their cancer condition. In most of our dogs with cancer, the infusions were performed twice weekly and continued for a minimum of one month, if not longer. There are limiting factors, thus, with intravenous vitamin C usage in the dog with cancer. The first limitation is access to a vein for administration. Central lines or long-term use catheters are not common in dogs with cancer, so a new catheter is often placed with each infusion. Over time, access to a vein can prove problematic. The second limitation is often the owner themselves, lacking compliance in returning their dog to the clinic for the infusion as directed. The infusion generally take 2 hours and most of the time, I would request that their dog be dropped off for the day, which makes it easier on both parties. Again, despite this, many owner would fall behind after the first week or two. Many would see clinical improvements, and thus determine that their dog was healed, and then stop coming in for the infusions. Either way, this aspect greatly limited the full benefits that could be achieved in many cases of cancer in the dog. Now, some question whether if oral vitamin C can be just as effective? The reality is that in a pinch, it can help and could be used if the intravenous route is not an option, but the results are inferior. As mentioned, there is a limit as to how much vitamin C the digestive tract can absorb, thus you will never achieve the same blood levels compared to the intravenous route. This is the biggest problem, but there is a way around it which can enhance the effect which is through the combination of vitamin C with vitamin K. These two nutrients can be combined in a set ratio (100:1) and given orally to the dog on a daily or twice daily basis. Through the combination, the oxidant effect on cancer cells is enhanced, as compared to just vitamin C being used alone. It is still not as effective, in my experience, as the intravenous route, but it can provide some benefits. Many times, I would continue the oral vitamin C combination during the off-days, in between intravenous infusions. I do believe there were benefits to the patients. Vitamin C is a powerful nutrient that all living mammals benefit from and require. I do believe that despite the dog being able to internally manufacture their own vitamin C, they do benefit from targeted supplementation in any cancer therapy protocol. Is this due to a poor diet and relative deficiency? Is this due to an increased demand for vitamin C by the dog’s body in a cancer condition? Or is this due to the enhanced anti-cancer effects of vitamin C? I honestly don’t know and likely, it really doesn’t matter and all three factors are playing a role. I do believe that all dogs with cancer could benefit on some level from appropriate vitamin C therapy, whether if that is in the oral or intravenous form and that no dog with cancer should go without. Vitamin C can be used in addition to traditional modes of cancer therapy, including chemotherapy, radiation, and especially surgery with no negative interactions when used properly. In all honestly, the research is obvious on the human side, but you just need to apply what is known. Given the high level of potential benefits to the dog with cancer, it is a therapy that should not be ignored. Even if you just gain an improved quality of life, appetite, and aid in maintaining body condition, the results are invaluable when combined with a proper diet and herbal therapy. I believe that the hardest part of implementation is finding a veterinarian that is both willing and knowledgeable of intravenous vitamin C usage. Even if they are not knowledgeable, with a little bit of desire, the information can be quickly acquired and with that, an improved level of comfort for the veterinarian regarding usage. Sometimes we just need to step outside of our normal comfort box and explore options.